Chewing is a natural instinct for many animals, and especially for dogs. For puppies, chewing can help alleviate the pain that might be caused by incoming teeth, while for older dogs, it is a way to keep their teeth strong, clean and healthy. It can also help to relieve boredom, anxiety or frustration. However, if you have a heavy chewer, you may find he chomps through his toys quickly. 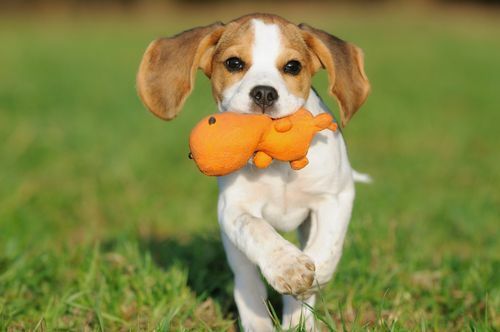 Toys provide important mental stimulation for pets, helping to control their behavior and keep them entertained even when you can’t be with them. However, your pet will naturally chew them, meaning that if your dog is an enthusiastic chewer, you may want to invest in a hardier solution. Here is our guide to some of the best indestructible dog toys on the market today. Kong are well known for their high-quality dog toys that cater for all sizes and breed. Their Extreme Flyer is made from their Extreme ultra-durable rubber, and is soft on your dog’s teeth and gums while still being able to withstand heaving chewing. Perfect for games of fetch, the KONG Extreme Flyer is also flexible enough to be folded, making it portable enough to take with you anywhere you go. A bestseller, the Zogoflex Hurley combines all of the fun of a stick, a bone and a ball into one epic, durable dog toy. It even floats, making it perfect to be used in water. It is soft enough to be gentle on your dog’s teeth and gums, while being strong enough to have a long lifespan, even when owned by the most enthusiastic of chewers! The Hurley is available in a range of sizes, meaning it is suitable for every breed of dog, and it is BPA-free, phthalate-free and non-toxic so you can rest easy every time your pet plays with it. If you are looking for a long-lasting toy that is also going to be great for your dog’s teeth, then look no further than the DuraChew Dental Chew. Designed specifically with heavy chewing in mind, it has gently rounded dental nubs and raised bristles that will help to clean your canine’s teeth, and reduce plaque and tartar. Dental health should be a priority for any responsible owner, and this toy is a fun way of ensuring you are taking steps to look after your pet’s teeth. DuraChew products are made from tough, durable nylon meaning that they can withstand some major chewing! If your dog is a sucker for a squeaky toy, but the regular variety just can’t stand up to the chewing, then look no further than the Kyjen Plush Squirrel Squeaker Mat. Made with ultra-durable, snuggle plush material with an incredible SIXTEEN squeakers inside, this toy is indestructible and will keep your pooch entertained for hours on end. Available in two sizes and weights, there is a squirrel suitable for every breed of canine companion. We haven’t come across a dog yet that doesn’t love playing with a ball. The KONG Jumbler is the daddy when it comes to tough and resilient ball toys. The two-in-one design offers twice the interactive fun. The interior has a squeaky toy, while the outer layer has two handles that make it easy to grip, shake and throw. It is also available in two different shapes – ball and football. With two sizes to choose from, you are sure to be able to find a Jumbler suitable for your enthusiastic chewer. If tug’o’war is your pet’s favorite game, then you will need a tug toy that can stand up to some serious wear and tear. The Multipet Nuts for Knots 2-knot rope tug with tennis ball is the perfect toy for a dog that wants to put his teeth to the test. Designed specifically for active chewers, this cotton rope has a pull bar one end and a ball the other, giving him plenty to get to grips with. And if this specific design isn’t right for your pet, there are plenty of other Nuts for Knots styles to choose from.